It was our wish that Luke should go to mainstream school when the time came, and he followed his older brother Matthew and sister Emily to Wildground Infant School (our catchment school). 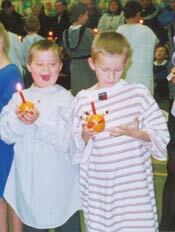 Wildground had never before had a child with Down syndrome at the school prior to Luke's arrival. 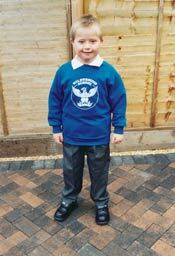 He was welcomed into the school and from the very beginning everyone has worked hard to make it a success. We always felt able to go in and to discuss any worries or concerns we had and the school did the same with us, and really any problems were dealt with straight away. When Luke was in Year 2, the children in the class were included when a few difficulties arose, for example it was noticed that some children would speak to Luke in a rather stilted or babyish way or would finish a sentence for him or add in what they thought he was going to say. Whilst Luke was out of the class his Year 2 teacher, Mrs Gardiner, spoke to them about this and explained that they were to give him a bit longer to let him say what he was trying to say and not to baby him. Luke has been fortunate in Year 2 and 3 to be with the same class of children are very kind and caring towards him (the Educational Psychologist noted in her last report that there was a caring ethos in the classroom). One of my favourite stories of Luke's time in Year 2 is one that moved me to tears when I was told about it. Luke's teacher, Mrs Gardiner, would choose a child before lunch each day to stand up and say a prayer, When Luke was chosen he would stand in front of the class with his hands together and say "thank you dinner ladies", the class who were to repeat the prayer would say "thank you for the dinner ladies". They would sensitively fill in the words Luke had left out, something they had not been told to do, but an example of what a lovely class they are. It has also been beneficial for Luke throughout his time at school to be sat in the classroom next to children who are good peer role models in manner and behaviour and who are likely to be sensible and help him in a sensible way. After Luke's first year at school we were all frustrated by his lack of progress with speech and language. Following several months of asking for a change of speech therapist and pointing out our dissatisfaction with the one we had (she was unable to treat Luke as an individual, and gave everyone with Down syndrome the same speech therapy regardless of age, ability etc.) I obtained a list of private speech therapists and contacted Sue Thomas and we have never looked back. Again, Wildground School were happy to work with someone that we were paying. Sue told me that she visits many schools in Hampshire, but Wildground was her favourite and everyone was always friendly and helpful, the teacher, the learning support assistant and Special Educational Needs Co-ordinator (SENCO) all worked together and gave up time to spend with her on her visits. Most importantly Sue said that when she left the school she knew that the work and programmes she set would be implemented and Luke would have made progress by the time her next visit came around. Sue was also able to give us things to do at home, one example being when Luke was 4 years old and she first came to us, he would stand in the kitchen and say "iscuit" or "ink" for 'biscuit' and 'drink'. Sue told us to stick pieces of card on the biscuit barrel with "can I have a biscuit" written on it and Luke would read this out before he could have a biscuit. It worked on all sorts of things, e.g. "can I have a drink?" or "Can I have a video on?" One of the main reasons that Luke's inclusion has been such a success is that everyone has always been open and frank about everything and as the SENCO once said to me, "we are all on a steep learning curve, but we are all working together to make sure that we get it right for Luke". Every member of the staff at Wildground from the head teacher, Mrs Kemp, his teachers, Mrs Dixon his LSA, and the lunchtime assistants all worked hard to make his inclusion a success and we can never thank the school enough for their commitment and dedication. Luke has now moved on to Wildground Junior School and his first term there was smooth and problem free thanks again to the two schools working closely together to achieve this. Luke also benefits at home from being part of a loving family and having an older brother and sister who are good role models (most of the time anyway!) It is also nice to see him annoying his younger sister Sophie by reading the words in her school reading book before she does. Click here to see a list of inclusion resources.